In June 1931, the first commercial doors operated by a photoelectric cell were installed on the swinging doors between the kitchen and dining room of Wilcox’s Pier Restaurant in West Haven, Connecticut. A device that converts light from the sun into electricity is called a photovoltaic cell. 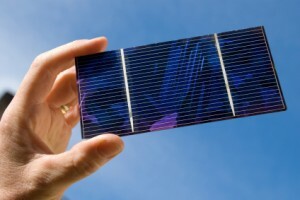 Also known as a solar cell, these are assembled into groups called photovoltaic arrays, solar modules and solar panels. The scientific field involving this technology and the research associated with it is called photovoltaics. Using photovoltaic cells is one of the most advanced ways to harness solar energy. Have you ever been in one of those restrooms where the faucets begin to flow automatically when you wave your hands underneath them? Or walked through an electric door that opened just as you approached? Your home maybe fitted with invisible “magic-eye” beams that drive away intruders by sounding an alarm. You must have seen a calculator that makes power with a little built-in solar panel. When light falls on it, it produces enough voltage to power the display and the electronics inside. All these are examples of photoelectric cells, sometimes called photocells. Albert Einstein won the Nobel Prize not for relativity—his best-known contribution to physics—but for his earlier work on the photoelectric effect. The fundamental theory of photoelectric emission was put forward by Einstein in 1905 on the basis of the German physicist Max Planck’s quantum theory (1900). Thus, it was not surprising that light was found to have an electronic effect. The way a solar cell works is quite a simple process. Photons from sunlight impact a solar panel. These photons are absorbed and the negatively charged electrons are knocked around the semiconducting material producing electricity. These cells can be implemented in all types of devices. Vehicles such as solar cars use this technology. Houses have applied the same science to bring down the cost of power consumption and there are also small devices such as solar cell phone chargers. Photovoltaic cells are an inefficient way to gather energy. While the first solar cells could only gather approximately one percent of the solar radiation, as of 2007, this was increased to 30 percent. However, this is still well below the efficiency standards of other energy sources. Many businesses and colleges have proposed concepts to raise the efficiency level of photovoltaic cells. As of 2009, high efficiency solar cells are being constructed by a variety of industries to make better use of solar energy source. The future of photoelectric cells is bright given the growing demand of energy consumptions.